Marie Claire searched campuses across the nation to find our nation's most stylish students. Hundreds of applicants competed and University Fashion Group's own member, Diya Liu, is one of the four finalists! As a finalist for the Marie Claire Front Row College Challenge, Diya will be hosting a fashion show sponsored by LOFT, Marie Claire, and Rimmel! 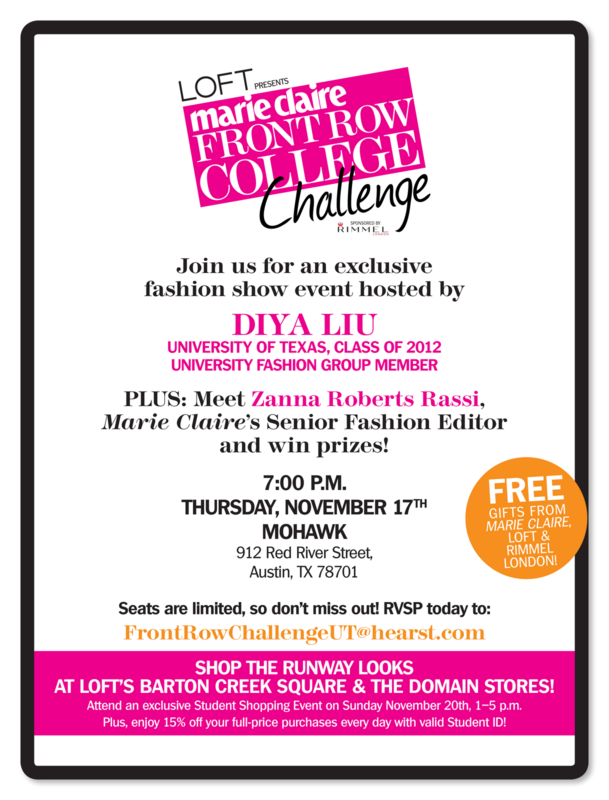 The fashion show will be Thursday, November 17th at Mohawk at 7:00pm. Diya's blog, DiyaInHerStilettos, has been featured on MTV Style's website and Chictopia. She is a senior majoring in Chemical Engineering and Honors Biochemistry. Here is a look at the behind-the-scenes of the four finalists in New York styling looks for their shows!